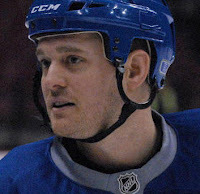 On December 20th in 2011, Vancouver Canucks aficionado Michael Buble fulfilled a life-long dream of skating with the team during an off-day practice after signing a one-day contract with the club. Donning the never-worn-before number 88, Buble challenged three-time Vezina nominee Roberto Luongo to a shootout, ringing a wrist shot wide stick-side off the left post before catching an edge and crashing awkwardly into the end boards. Afterwards, Buble surmised “I should have faked the shot backhand and tried to go upstairs, I just missed it. I thought I'd perhaps be the next Alex Burrows, but it turns out I'm crappy". Canucks head coach Alain Vigneault reserved judgment on Buble. 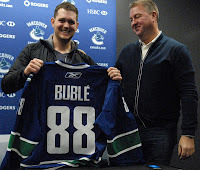 Buble's "greatest day of my life" follows other superfan moments including coloring a game with Canuck's voice John Shorthouse in 2009, serenading Canucks broadcaster Tom Larscheid in a duet with Shorthouse during a sold-out Vancouver show in 2010, and rescheduling concerts to watch the Canucks during the Stanley Cup Final in 2011. 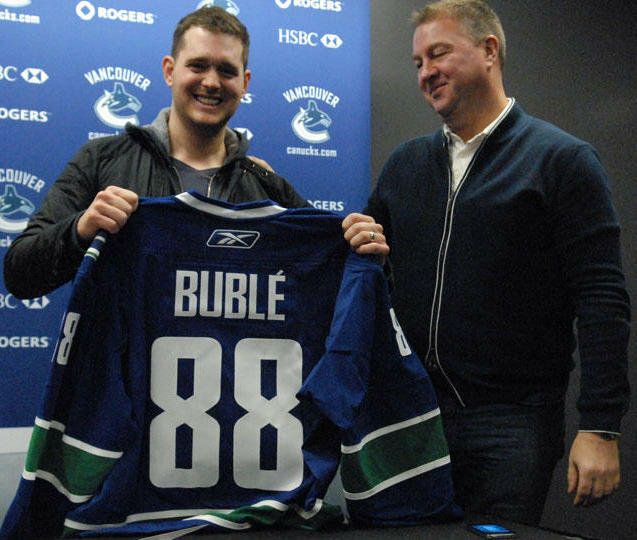 Buble even wove a Canucks reference into his chart-topping album "Christmas", tweaking a lyric in "Santa Baby" from "I'm filling my stocking with a duplex and checks, sign your X on the line" to "Fill my stocking with Canucks tix for kicks, throw me on the first line". The three-time Grammy Award winner and two-time Saturday Night Live musical guest will leave puck to the pros and stick with song for now. Per club policy, the financial terms of Buble's contract were not disclosed.